I binge-watched ‘Riverdale.’ Here are my thoughts. After being asked to watch the series for a long time, I finally gave in and binge-watched both seasons of Riverdale. The following are my thoughts on the series. Note that I have not read the Archie comics, so my thoughts are based solely on the television series. After watching the first episode, I immediately got a Pretty Little Liars vibe from the series. However, by the end of the first season, it was abundantly clear that the two series could not be any more different. Riverdale, while keeping its momentum, also does an amazing job creating and maintaining a small-town feel. A lot of series start off like this and ultimately plunder the feeling (Once Upon a Time struggles with this a lot), but through its vast cast of characters, the series never ceases to give off this small-town vibe. We know the mayor, the town sheriff, the owners of the town newspaper, the high school students, the owner of the local diner. Everything culminates in a town trapped in time full of relatable individuals with relatable circumstances. In addition to the cast of characters, the town’s ever-expanding lore enticed me practically as soon as the first episode. As the series progresses, we learn increasingly more about the town, from its founding to its families’ histories to its neighboring towns to the divisions within the town (looking at you, Southside Serpents). We are provided with fascinating juxtapositions of morality, money, family, and crime – and how these factors affect both everyday life and the health and prosperity of the town and its individuals. Riverdale as a series also isn’t afraid to make a statement. In a time where American politics are more divisive than ever, we see a main character forced into conversion therapy by her mother for liking the same gender as herself. These scenes with the Sisters of Quiet Mercy immediately made me uncomfortable, but then I realized that was the point. Favorite character: This is very hard because of the sheer amount of characters, but Cheryl (Madelaine Petsch) and Veronica (Camila Mendes) are both such strong characters. They are diverse and growing and their journeys are kind of everything. Other notable characters I like are Polly (Tiera Skovbye, though it’s partially because I know the actress from Once Upon a Time) and Alice Cooper (Mädchen Amick). Alice’s story of being from the Southside and becoming a journalist and becoming so established is something I really enjoyed watching and learning about. Alice Cooper (Mädchen Amick) proving that she’s more than just a journalist/mother. Bonus: My least favorite characters are Nick (Graham Phillips) and Chic (Hart Denton). Nick I probably don’t even need to explain. As the viewer, you’re supposed to despise Nick. And I did. Chic, however, I feel almost bad about disliking because the writers work very hard to give him a complex story and sympathy, but it just didn’t work for me. Favorite scene: Hard again, but after her name was dropped each of the first six episodes, one of my favorite scenes was finally meeting Polly at the Sisters of Quiet Mercy. Her circumstances there and the events leading up to being placed there are heartbreaking, and then on top of that we see it from her sister’s point of view where she never knew where her parents had hidden her sister. 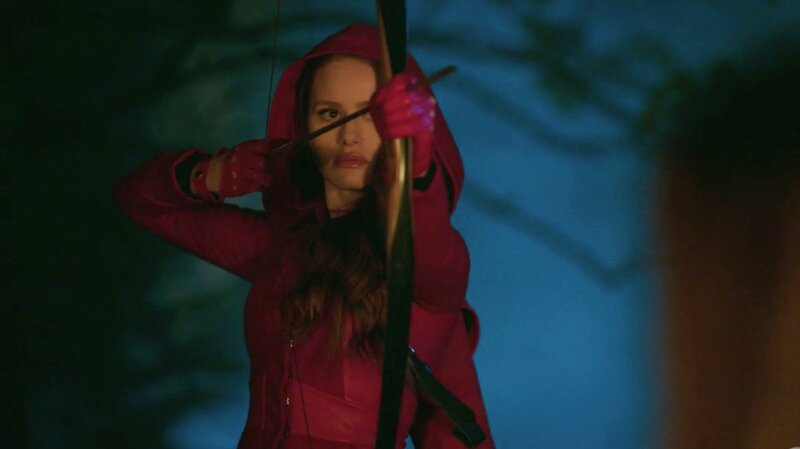 Another favorite lies in season two when Cheryl is attacked by the Black Hood. She grabs her bow and arrow and red hood/cape and becomes a complete powerhouse (not that she wasn’t already). Ultimately, the characters and their growing connections sold me on the show, and the ever-intense plot kept me for the wild ride that is Riverdale. The first two seasons can be found on Netflix, with the third season coming this fall to The CW. Are you loving this hit series as much as we are? Comment below and tweet us @Fuzzable with your love for all things Riverdale!